In a blender, blend the spinach leaves with a little water. Mix the spinach leaf puree with the wholemeal flour and form small balls. Cover them with clingfilm and let them rest. Cut the chicken breasts into small pieces and fry with a little salt and pepper. In a bowl, add the grated carrot, the yoghurts, the chopped coriander and the juice of 1/2 lemon. Mix well. Flour the spinach balls and flatten them with a rolling pin. 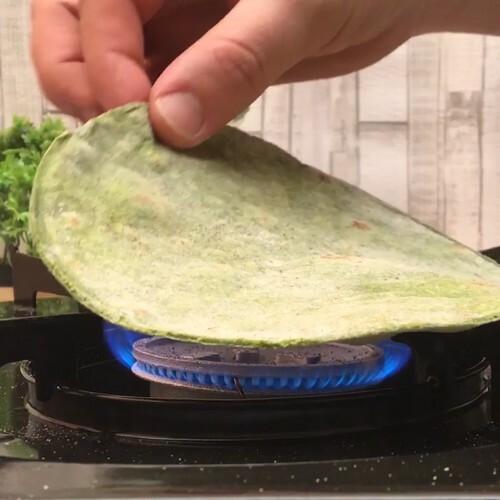 In a dry pan, cook the wraps for 3 minutes on each side. Finish cooking them by placing them directly onto a naked flame for a few moments to make them swell. Add the carrot and yoghurt mix and chicken to the wrap, and roll them up and enjoy.